If you’ve ever been owned by a cat, chances are you’ve heard the acronym “FIV,” short for feline immunodeficiency virus. You most likely heard about it during your cat’s wellness visits when your veterinary team discussed wellness and preventive care, though it can be easy to confuse it with FeLV (feline leukemia virus), FIP (feline infectious peritonitis), and the FVRCP combination vaccine (which protects your cat from another set of diseases). That's a lot of acronyms to keep straight, so let’s fix some confusion and look more closely at FIV, your cat’s risk, and treatment for infection. FIV is a retrovirus in the lentivirus subfamily (the same subfamily as HIV in humans) and shares some characteristics with HIV. Moreover, FIV infection - like HIV in humans - does NOT necessarily mean your cat has feline AIDS or that kitty is necessarily going to have a shortened life span due to infection. Which cats are likely to be infected with FIV? FIV is transmitted primarily through deep bite wounds that occur during cat fights. While it can be transmitted during sexual activity, research has shown that sexual transmission is much less common than through bite wounds. Other interactions between cats, like mutual grooming, sharing food/water bowls or grooming tools, and sharing a litter box, have not been shown to be significant in transmission. Additionally, FIV occurs in relatively low rates: 2-4% of all cats in the United States are thought to be infected. It is most common in feral or free-roaming community cats, particularly among unneutered, adult males who are most likely to fight. Therefore, any cat allowed outdoors (at all) that comes in contact with these cats is at risk of infection. Indoor only cats are the least likely to be infected. What are the clinical signs of FIV infection? Immediately following infection with FIV, the virus moves to the lymph nodes where it reproduces. This causes a temporary enlargement of the lymph nodes and a short-term fever. Depending on the severity of both, this initial infection period may go unnoticed. Initial infection is followed by a period of "viral dormancy" which can last as long as six years! This means that, unless the cat is specifically tested for the virus, FIV is generally not diagnosed in very young cats. Additionally, cats who are infected later in life may never show signs of infection. When signs of illness start to surface, you’ll likely see signs that the kitty just doesn’t feel well: refusal to eat, weight loss, and lack of self-grooming. Most commonly cats will experience a severe infection affecting the gums, just around the teeth. Also, any wounds that occur could be quite slow to heal. The same is true for respiratory infections; they may linger much longer than would normally be expected. A cat with FIV might also struggle with persistent diarrhea. Just like with HIV and AIDS in humans, it isn't FIV that can ultimately cause death, but opportunistic infections or cancers that take advantage of the cat's weakened immune system. How do we diagnose FIV? There is a simple blood test to check for exposure to Feline Immunodeficiency Virus. A positive test means the cat has been infected with the virus and will likely remain infected for the remainder of his or her life. A negative test may mean that the cat has not been exposed; however, false negatives do occur. Because it can take 2-3 months for antibodies to be detected in the blood stream, it's recommended that cats be re-tested 3-6 months later. The vast majority of kittens under four months of age that test positive for FIV have not been exposed to the virus. Instead, the test is detecting the antibodies that actually were passed from the mother to the kitten. These antibodies may persist until the kitten is about six months old; therefore, the kitten should be retested at that time. If the test remains positive, the possibility of true infection is much greater. If the kitten tests negative at that time, there is no cause for worry. If an FIV-infected cat bites a kitten, he or she can develop a true infection. However, the FIV test will usually not turn positive for several months. If a mother cat is first infected with FIV at the time she is pregnant or nursing, she can pass large quantities of the virus to her kittens. This means of transmission may result in a positive test result in just a few weeks. It is important to note that there is no cure for FIV. In some cats, the disease state can lead to rapid deterioration, but in others it can be recurrent, with periods of relatively good health punctuated by periods of illness. In this way, FIV is, for many cats, a chronic condition. Because illness in FIV-positive cats is caused by opportunistic infections and cancers, the disease state can sometimes be treated, restoring the cat to relatively good health until the next bout of illness. It is strongly recommended FIV-positive cats be restricted to the house (indoor only). 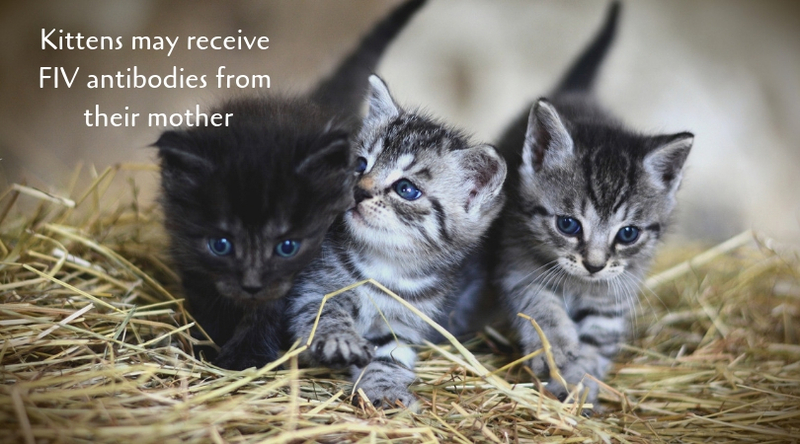 Owners of infected cats must be responsible and minimize the risk of transmission to other cats. Additionally, raw diets are strongly discouraged in order to minimize the risk of food-borne pathogens. Finally, we strongly recommend FIV-positive cats have full wellness exams every 6 months. Can this virus be transmitted to me or my family? The feline immunodeficiency virus is cat-specific. It does not infect humans. How can I prevent my other cats from getting infected with FIV? Spaying or neutering your cats and keeping an infected cat indoors are the best preventive measures for this virus. Depending on the cats in your household, it may be recommended that you keep any FIV-positive cat(s) separated from your other kitties. 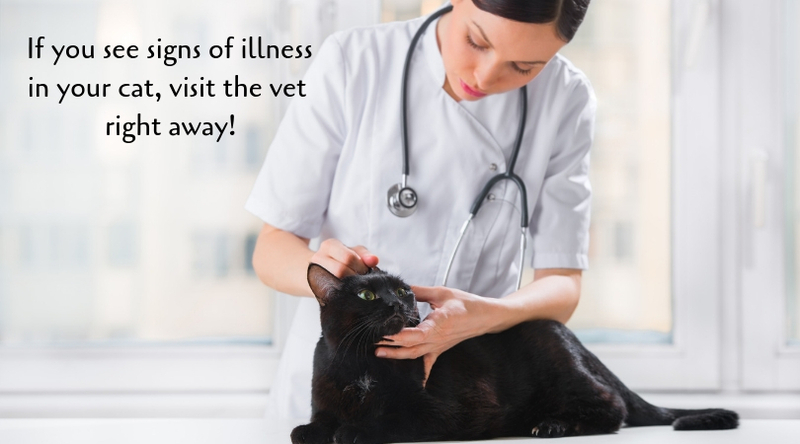 Talk with your veterinarian for specific recommendations. If you have any questions about FIV or any conditions that may affect your cat, please don’t hesitate to reach out to us! Chronic conditions can be managed, and we want to be your allies in keeping your beloved cat as healthy and happy as possible!